john whitford : surf canoes and boats, west africa, 1877. A belt of light yellow sandy sea-beach, with flat country above it abundantly wooded, stretches north and south as far as the eye can reach. It is fringed by the white surf caused by the long Atlantic waves. These waves, when the air is calm, give the idea of rolling prairie country. They are then smooth, but undulating, and ever moving onwards, till, on coming in contact with the shore, they curl their monstrous heads, and, breaking into foam, hiss upwards and expend their force. Reefs of rocks extend here and there at some distance from the land, upon which the sea, dashing with all its force, makes a tumultous, angry foam. These are the breakers so much dreaded by mariners, and constitute one of the perils of the sea. Black spots of rock peep out from the seething waters, and woe to the boat or ship that strikes on to them. It means dire disaster, destruction, and death. A collection of thatched huts, peeping out from amongst the trees, is the village of Grand Cess, Kroo Country. The report of the ship's gun arouses the inhabitants, and hundreds of dark forms rush at once over the bright beach to launch their canoes into the surf and through it. These canoes go bobbing up and down, dancing on the blue water. They are very light, are carved out of one piece of wood, gracefully formed like a cigar tapering at both ends, and are propelled by one or two men, squatted upon their heels in the bottom of the canoe. If only one man occupies the canoe, he uses his paddle first upon one side and then upon the other; but, if there are two men, each takes his own side, and their well-developed muscular action swiftly urges the graceful skiff towards the steamship. It is a glorious sight to watch the race of at least two hundred canoes. The paddlers yell with ecstasy as they approach, and familiarly hail well-known faces on board. Captains of African steamers have each their favourite head Krooman. The numerous wives of a head Krooman, knowing this, seem to look upon their husband as the real commander of the ship.
" Nimbly," " Tom Bestman," "Shilling," "Bottle of Beer," "Prince of Wales," "Salt Herring," "Gladstone," "Flying Jib," "Bismarck," and hundreds of other equally fantastic names, conferred according to the fancy of their employers, stick to them through life, and their heroic deeds are sung and recited to crowds of evening parties in Kroo Country. Whilst the captain is thus engaged, hundreds of natives climb over the ship's side in the ordinary full-dress costume of the country, consisting of a necklace, in addition to which as Mark Twain says, " they wear a smile." The neco number selected, the steam-winch runs the anchor up, and oft' we go full speed ahead. The Kroomen who are not wanted (a few have been employing their time on board trading cocoa-nuts, fresh fish, or live birds for biscuits) actually jump overboard to swim to their canoes. to rub your eyes, whilst laughing heartily, to look again and realise it. Jumping into the sea and swimming a mile, or perhaps two miles, to your canoe, would be rather a novelty to those who are accustomed to land at a wharf and jump into a cab. All along the Kroo coast, extending from Cape Mesurado to Cape Palmas, it is a common thing to meet with canoes ten or twelve miles out at sea fishing. For the first time during the voyage our surf-boat is lowered, the mails from England are placed in it, six Krooboys ply the oars, and the third-officer takes the tiller. We gladly avail ourselves of the opportunity of going ashore. Though only a third-officer here, he has commanded a sailing vessel before now, and is working his way upwards to command a steamer ; he keeps his weather-eye open for breakers, which he avoids, and for the current, which he carefully estimates, and steers accordingly. crunching of the boat upon the beach causes our teeth to close suddenly. Tourists should not talk during these exciting moments, lest the tongue be caught unpleasantly between the teeth, producing a worse shock than galvanism. gracefully, though with a hissing noise, drawing with it sand and pebbles lo ! another raises its crest and overwhelms the boat and its contents like an avalanche. We get out on to the backs of Kroomen, who carry us to dry land. They shake themselves as ducks do after a thunderstorm, and are soon all right ; but we feel uncommonly damp. It is not, however, an unpleasant sensation ; it is like using a bathing- machine without the trouble of disarranging your necktie and paying the customary sixpence. We steam close past the fortress of Elmina, and shortly afterwards anchor off Cape Coast Castle. It is a calm, lovely morning, and we all go ashore in one of the splendid surf-boats which were left behind by Sir Garnet Wolseley. These boats each accommodate twelve passengers, who are placed in the fore part, to prevent their getting drenched on landing through the surf. which they can't, or won't, understand. go, in a semicircle, and with much gusto sings the solo of a song, taken up by the rest in chorus, in regular and correct time, as their flexible and utterly unclothed bodies bend over the sides. higher on the beach than the others. The steersman has to calculate his time, and also the force of the sea ; for, at the exact moment, he gives the word in his own language to paddle ahead as fast as possible. The men put forth their full strength, and "on the top of a billow we ride." one can wonder at the mass of foam, the Fantees have lifted you out and carried you up beyond the reach of the following wave. This is the only way that anyone can get ashore. It must truly have been a difficult matter with such inadequate appliances to have landed the British army on its way to Coomassie. them very useful in discharging or loading vessels. These craft have entirely superseded the old lumbering canoes, and even the more modern canoe-shaped boats. As they were made for the transport of the English army, no doubt the best talent and naval architectural skill would be employed in their construction ; they answer admirably. is deeply interesting to look at the remains of old canoes, stems, ribs, and frames of old whale-boats, which carried in their time tens of thousands of slaves to vessels waiting for the living cargoes in the offing. Here also are long sheds, once called " barracoons," going fast to ruin, in which the slaves were housed whilst waiting for shipment. High look-out wooden boxes, formerly used to signalise slave vessels and announce the coast clear, or give notice of the approach of British cruisers, are fast tumbling to pieces. It is very melancholy to look at such diabolical places, and it is better to be alone and think. You feel proud of your country for having with strong national will stamped out the infamous slave traffic. Thus pondering on that solitary beach, with the Atlantic rollers fringing the bright sand as far as the eye can reach with a line of white foam, the moaning of the wild waves sounds like a perpetual death-wail. During our short stay at Igbegbe, the river-bank in front of the vessel was crowded day and night. Early in the morning, women came down in troops to bathe, and some of them were capital swimmers. They played a variety of mermaid antics. We appreciated their free and easy manners as interesting samples of dark-complexioned Venuses on the loose water. All day long strings of women came for water with earthenware jars upon their heads, holding from five to eight gallons each jar. These they fill by wading into the river, and then carry them away upon their heads, wriggling their agile bodies beneath the weight, just as the Arab women do on the banks of the Nile. They linger, too, over filling the jars ; and, from their confidential conversation, evidently the place to obtain water is their school for scandal. The Porcupine Office, Liverpool, 1877. 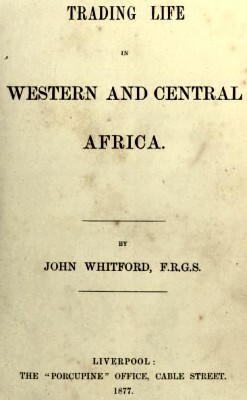 Geoff Cater (2013) : John Whitford : Surf Canoes and Boats, West Africa, 1877.